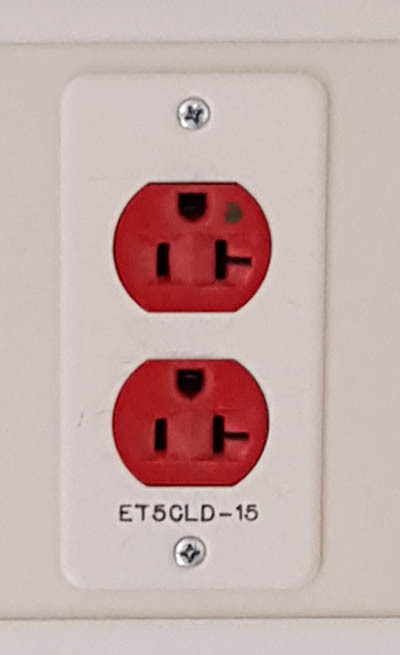 What Are The Red Outlets In Hospitals And Medical Facilities? – Battery Backup Power, Inc. The red outlets (sometimes referred to as sockets) in hospitals and medical facilities indicate that they are on emergency backup power. The bright red color helps nurses, doctors, and hospital staff quickly and clearly identify where to plug in critical equipment during an emergency situation. The backup power usually consists of a combination of battery backup (energy storage) and generator power (energy production). The battery backup provides uninterrupted power to critical lifesaving equipment (immediate backup power) while a propane, diesel, or natural gas generator (slower to begin providing emergency power) on an automatic transfer switch kicks on when there is a power outage or disaster making the power grid unusable or unreliable. Depending on the facility and if the generator is automatically or manually turned on, it can take anywhere from a few minutes to half an hour for the generator to start producing usable power. The uninterruptible power supply (UPS) fills this time gap. To be considered “hospital grade” or “medical grade”, the backup power solution usually must provide pure sine wave power to operate sensitive medical equipment. If an uninterruptible power supply (UPS) is used, it typically must be a double conversion or online type system. This means that battery power is always engaged rather than having a multiple millisecond delay like in “consumer grade” or “business grade” uninterruptible power supply (UPS) systems. A secondary reason for the uninterruptible power supply (UPS) to be a double conversion or online type is due to the fact that usually only these type of battery backup systems can run on generator power. All of the Battery Backup Power, Inc. double conversion or online uninterruptible power supply (UPS) systems have a “generator mode” which can be activated from the display screen on the front of the unit. For a list of these systems, please visit: http://www.backupbatterypower.com/collections/online-double-conversion.